As I said last time, I have another finish for the FAL and once again it's something started recently, this time it's a bit of paper piecing for my kitchen. 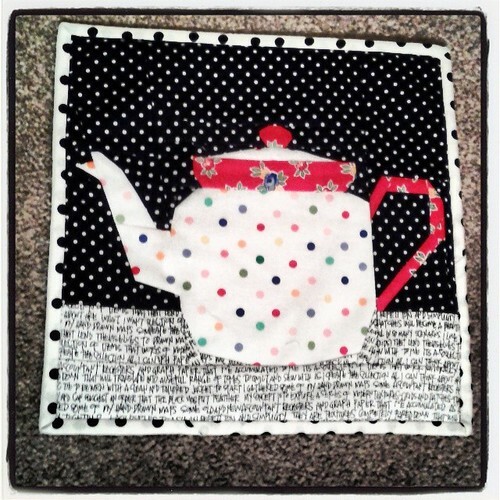 This months fab pattern from Kristy at Quiet Play and the Sew Kitschy Sew Along was a teapot, and as I have a new kettle I figured it deserved a little pretty to sit on. As you probably realise by now, I'm rather partial to spots and polka dots, so I decided to include a few in the block, and here is what I came up with. I re-did the binding as the black bike path print I used originally (also on the back) just didn't work for me for the binding. Oh bugger on the thumb slicing, but nice finish. I presume you didn't get any blood on it! Some people just can't be trusted!!! Nice on the teapot stand, bugger on the thumb! ouch! I have a teapot that looks just like that along with two polka dot mugs - they are a favourite of mine too! This is so cute! How is your thumb now? Totally cute ! I love your dots, too!